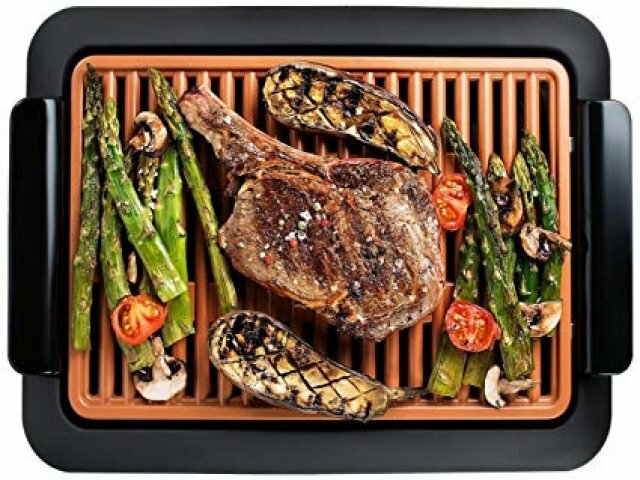 The Gotham Smokeless Indoor Grill is available on line or BJ's for about $60. Ours is a tad bigger. During the busy summer season it’s mostly eat and run to get to theatre, Jacob’s Pillow, and Tanglewood. The emphasis is getting something quick and easy on the table with minimum cleanup. The offseason means having more time for diverse and inventive meals. In our Adams house we grilled all summer. We downsized a couple of years ago and, this year, we never made it down to the common yard to use the grill. It is now wrapped in a tarp for the snow months. My friend Mark Favermann casually mentioned enjoying his Gotham Smokeless Indoor Grill. We already have several bulky kitchen gadgets which we use all the time. So counter space is at a premium. Careful measurements allowed for just fitting the compact grill into the last plausible space. That was at the end of a table next to our counter and under a window. That proved not to be necessary as the grill is indeed smokeless. There is a special coating to the metal and a shallow drip pan beneath it. Adding, and changing, a cup of water seems to do the trick. The fat drips into the pan and hence does not cause smoke. By now, we have tried lamb and pork chops, steak, sausages, chicken and a delicious, thick portion of fresh swordfish. In general, at the max setting, the grill does not get as hot as an outdoor grill. So one has to be patient with longer cooking time. Say a half hour for the chops or a thick steak. The grill is not that large but fine for the two of us. With meat we also grill some veggies. Recently we tried sliced polenta. Next time we will add a sauce like sautéed shitakes. Adding steak and chops to our repertoire has greatly expanded culinary horizons. But don’t grease the grill and avoid smoke inducing elements like marinades. This week I added dry rub to chicken drumsticks. I started them skinless with five minutes in the microwave. After a half hour of turning on the grill we got frustrated and finished them with another ten minutes in a 400 degree oven. By then they were perfect. Cleaning the grill with burned on rub was not problematic. But the manufacturer recommends soft cleaning techniques and not scouring as it damages the special surface. I have been using a gentle approach to a brillo pad to remove excess residue. So far there appears to be no damage. I make killer ribs on the grill so that’s next up. They will start in the oven with dry rub and some water in the pan. Then I will finish them on the grill. There is also the option of setting a low temperature on the grill and covering them with foil. Then cook low and slow for a couple of hours. While I like to look at cook books and on line recipes it’s mostly to get ideas and basic ingredients. That was the approach to a nice borscht soup I made last month with beets, carrots, onion and red cabbage using a beef stock. It was just terrific and lasted for several nights. After that it gets tedious. This week I have veal shanks for osso bucco. There are just four nice sized slices so that means two meals. I have prepared it a number of times and like to include lots of carrots, celery, onion, canned tomato, wine to make an abundant, stew like sauce. The meat, slow cooked, is tender and delicious. The marrow, of course, as every Sicilian knows, is to die for. Most supermarkets don’t have shanks but they are always available at BJ’s which is a drive away in Pittsfield. We just get there now and then and stock up on basics. In a similar way I also like to make lamb shanks one of my favorites when dining at Greek restaurants. Done right it is just fabulous. Nearby in Adams, Haflinger Haus does a nicely authentic Schweinshaxe. It’s a meaty portion of slow cooked pork shank. One has to be famished and in the mood to take it on. During our recent visit I opted for goulash but Robert went whole hog. Putting inspiration and variety on the table is great for a relationship. It’s another way of saying I love you. Getting fresh flowers also helps and Astrid likes to decorate with the seasons. It’s much more fun as a collaborative effort. Trying new recipes is risky. There is a margin of error. I held my breath during those first ventures with a “smokeless’ grill. Setting off alarms and stinking up the loft would be a setback. Jack sprat could eat no fat and his wife could eat no lean is something to keep in mind. What’s good for the goose is not always good for the gander. A successful meal is one we both enjoy. One thinks of all the failed dinners that Paul, the husband of Julie Childs, ate without a peep. The man was a saint. Usually, with a little tweaking it comes out better the next time. Particularly tricky nowadays is organizing a dinner party. It’s hard to create a menu that everyone will enjoy. Especially challenging is navigating vegetarian, gluten free, not too hot or spicy, minimum sodium and or sugar. That’s a daunting game of musical chairs. Last night, based on a NY Times recipe, with a little tweaking we may have found a winner. It looked so enticing that I just had to give it a try. That started with researching and ordering coconut milk through Amazon. (365 Everyday Value, Organic Coconut Milk, 13.5 Ounce at $1.99 plus shipping.) On seeing the product Astrid informed me it is available at Stop and Shop. The recipe called for two cans but I ordered four assuming that I would want to try this again. I also read reviews of various products before settling on the right one. Previously I had never cooked with that ingredient but knew it is essential to curry dishes I routinely order in restaurants. Opening the cans I found that there was a thick white paste with relatively little liquid. The recipe called for two cups of stock but I used a bit more. The ingredients nicely blended. Astrid wanted to know why I had my cell phone on the kitchen counter. I had the recipe in my e mail. Since it was tricky with multiple steps I wanted to have a handy reference. This is something I never do but I was reaching way out of my comfort zone. Mostly it came out just fine, quite delicious in fact. But there are things I plan to tweak before we have guests. I did all the prep work before getting started. That meant mincing a nice big hunk of fresh ginger. Being lazy I use bottled minced garlic. I cut up a smallish onion. While two cans of drained chickpeas were called for I used three and glad I did. I used a large iron skillet to brown the chickpeas with caramelized onion. I will double or triple onion the next time. During this step one adds tumeric and garlic as well as seasoning of salt and freshly ground pepper. What I thought was tumeric in our spice closes proved to be cumin. So I went with that as well as a teaspoon of curry powder. It was fine but I just ordered tumeric for next time. A pound. Astrid told me we already had it if I had taken time and patience to look or just ask. Unfortunately, I have none of those qualities, particularly when sweating over a hot stove. In the heat of the moment patience is in short supply. I tend to panic easily. One is supposed to add coconut milk and stock slow cooking for at least a half hour. My flame was set too high and when I tasted it, after fifteen minutes, the canned chick peas were soft and tender. The sauce was not as reduced as suggested but quite fine. As required, I used a teaspoon of flaked red pepper. It proved to be hotter than Astrid liked but tolerable. The recipe states that red pepper can be added as a garnish. Perhaps next time, for a milder taste, I will use a half teaspoon or none at all. 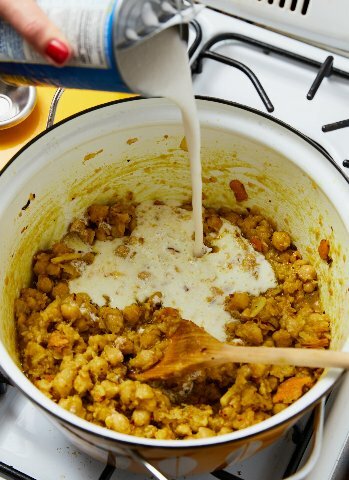 It can be added at the table and stirred in to taste for those who opt for more heat. I have also researched that Amazon sells mild curry which we will try. As instructed I added greens; in this case chopped kale. The tough spines were removed. After fifteen minutes I added a nice bunch of greens and cooked for another fifteen minutes. They were just perfect. Other greens are possible with a shorter cooking time for spinach. We added diced, left over chicken. But Astrid noted that chickpeas have protein and we really didn’t notice the chicken. This makes a perfectly satisfying vegetarian meal. I added some rice to mix in with the thick sauce. Other suggested options are yogurt on the side and pita bread. There are lots of other ingredients that would combine well with this dish. Green beans, carrots, and mushrooms are good options. Also, consider shrimp, clams or mussels. Moose is good. Why not? It’s all about making life more interesting. As instructed we added some of the reserved chickpeas as a garnish. Adding the extra can was brilliant. We have enough for tonight’s serving of leftovers. What follows is the text from the New York Times. As Julia would say Bon Appetit. With wine of course. I opened a nicely chilled, fruity, flavorful Vouvray. 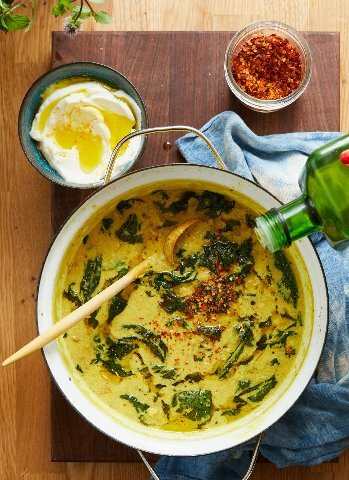 Spiced chickpeas are crisped in olive oil, then simmered in a garlicky coconut milk for an insanely creamy, basically-good-for-you stew. 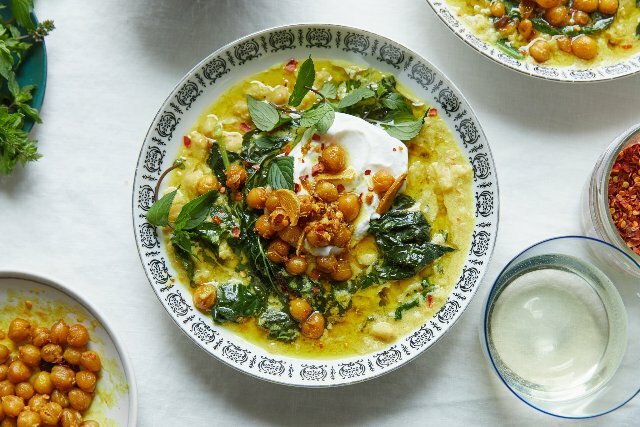 While the chickpeas would be good as a side dish, they are further simmered with stock, bolstered with dark, leafy greens of your choosing and finished with a handful of fresh mint. (We substituted cilantro.) When shopping, be sure to avoid low-fat coconut milk, coconut milk meant for drinking or cream of coconut: All are very different and would not be suitable here. Add turmeric, red-pepper flakes and chickpeas, and season with salt and pepper. Cook, stirring frequently, so the chickpeas sizzle and fry a bit in the spices and oil, until they’ve started to break down and get a little browned and crisp, 5 to 8 minutes. Remove about a cup of chickpeas and set aside for garnish. "Diced tomatoes added 10 min. before the greens, give color and taste contrast." "Thanks for bringing on the spice!"